Transforming the Financial Planning Experience. At Brix Wealth Management, our strength is strategic and comprehensive financial planning, with an emphasis on tax efficiency and a laser focus on ensuring action and progress. We’ve partnered with the most prominent thought leaders in the investment and asset management worlds to provide those services when needed. The alpha or “value” we provide our clients—deep and analytic financial planning—is not a one time process, but a lifelong dialogue. Using a family’s or business owners’ most critical objectives as a guide, we benchmark and stress-test all decisions to ensure we remain focused with an established roadmap. As the relationship manager, we coordinate the necessary thought leaders and professionals to curate custom-fit solutions. Our proven process consists of 4 unique phases—clarify & simplify, protect & grow, realize and empower. We will walk with you from envisioning your goals and creating a personalized roadmap to achieve them, to fully realizing your objectives and successfully building on your legacy. Many of our professional partners and clients request an objective analysis of their insurance, investment or annuity contracts, in conjunction with strategic planning for their financial goals and objectives. We provide a fee-based, impartial and product-agnostic service to help clients and professionals hold advisors accountable. Our clients spend their lifetime building their businesses, which becomes an extension of their identity. 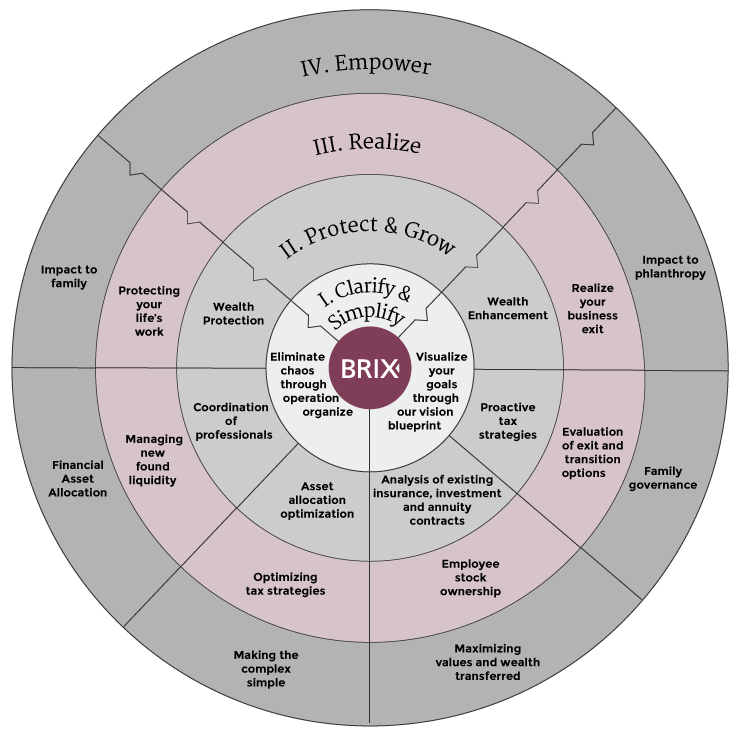 Brix Wealth Management guides clients through transitioning business interests into an impact—family, philanthropy or the world at large. Philanthropic intent and proactive tax management often go hand in hand. Before a client can sell a business, the business must be built in such a way that it can sell. From the organized creation of systems and processes to the implementation of “golden handcuffs” for key executives, we walk clients through a process to help them examine paths of building their business to maximize its intrinsic value rather than simply operating a lifestyle enterprise. As the company is built the right way, we analyze and stress-test each possible exit or transition option, while accounting for all contingencies. This analysis serves as a critical reference point as to when, how and to whom the company should be finally transitioned. By identifying the necessary exit number for the business owner (sales value that allows successful realization of retirement and legacy goals), we work to engineer the appropriate exit design and coordinate all necessary partners throughout the process. Our highly successful clients require asset protection in addition to legacy and income tax planning. Asset protection services can include but are not limited to: counseling your clients along with your legal team on the utility of asset protection strategies, implementing proper risk management plans and working with the critical professionals to implement. We design custom fit asset protection strategies to ensure the life’s work of a client is not unjustly taken from them.